WWE edited the fan reaction to Roman Reigns losing the United States Championship from a previous episode of Raw. 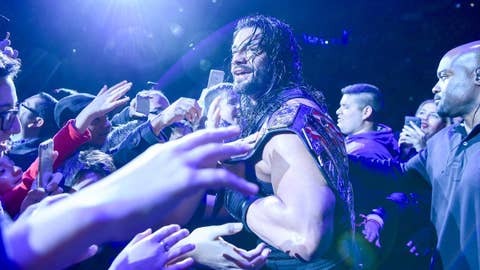 Roman Reigns has become one of the most polarizing figures in WWE today. This is from his time with the Shield, headlining two WrestleMania shows, and being pushed into the position of being the company’s next top star. His booking as a babyface has received criticism from fans as well, including an arguably predictable push during WrestleMania 32 season. Negative crowd reaction from this and other events have made the Big Dog a polarizing figure as well. Well, this might only add fuel to the fire. After losing the United States Championship to Chris Jericho on January 9, the camera panned to an excited fan after the pinfall finish. However, as seen by the video below from Jason Solomon of the Solomonster Sounds Off podcast, WWE edited the post-match video. Instead of the fan jumping for joy, the same one had his hands over his head in shock once Jericho won the belt. This comes after WWE altered an anti-Reigns sign from the Payback 2016 pay-per-view. The edit could be a way of WWE covering up for a production flaw from last week, as they would want to show the babyface getting a positive crowd reaction after his win. This may also be taken as WWE wanting to make Reigns liked by the fans by showing others supporting him. Given the age of social media, small things like this will always be pointed out. Everything gets uploaded or talked about on Twitter or Facebook, even something as tiny as a mispronounced word from a WWE personality. This is Reigns, though, someone who sometimes receives a more vocal negative reaction than John Cena ever did. Something like this won’t help his case as we get into WrestleMania 33 season. What is your takeaway from this? Did WWE make the right or wrong move editing the reaction to Roman Reigns’ loss?